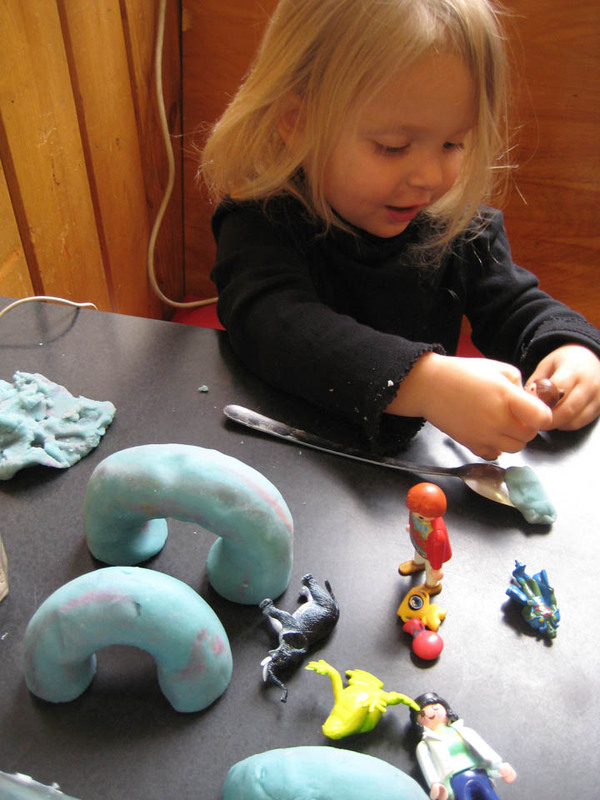 I brought Echo to the café this morning, with a giant lump of play-doh, and some play mobile figures. I also carried the laptop and some, perhaps too high, hopes of working on the Feeleez Learning Guide. But Echo is pretty darn magnetic, attracting friends that soon joined our table, pushing aside lumps of blue play-doh to make room for their coffee, and I was drawn out of the word processing world. Quite content with her piles of fun and a non-typing mama, Echo was in no hurry to leave and we saw several batches of friends come and go. The clock ticked toward lunchtime and the café began to fill up. Without a free place to land, an older woman asked if she could join our table and read her magazine. I said: oh, of course! and began shuffling our detritus into semi-containment. I was feeling pretty good about our polite manners, but I hadn’t factored in everything, most noticeably Echo’s feelings. Apparently it was one thing to share our table with people she actually knew and enjoyed, it was quite another thing to share our table with a giant stranger dressed in black with a big hat and dark lipstick. I saw our polite manners begin to go down the drain. I don’t want to her to share our table with us!!!! (nearly screeching). Oh! Looks like your ready for a nap! You’re tired. On any other day I would have been extremely annoyed by this comment. But today I was so happy that the woman completely ignored what Echo was saying and instead barged in with a misplaced assumption. Temporarily saved! This bought me the time to cradle Echo in my lap and whisper fervently in her ear. Okay. I hear you don’t want that lady to sit here. But she is going to sit here. NO! I don’t want her to sit here! Echo. ( I am whisper shouting directly into her ear by this time). I am really concerned about the lady’s feelings so I want you to whisper while we talk. I told her she could sit here and I am afraid she will feel uncomfortable if she hears you talking about wanting her to leave. But I do want her to leave!!!!! Echo I’m not going to ask her to leave the table. Uh…. mostly because it is so uncommon to ask someone to leave after you’ve invited them to join, that I’m afraid the lady might feel really confused and maybe mad too. But I want her to leave! Then I realized: a. I could relax a little because the lady seemed to actually be reading her magazine and wasn’t taking notice of our whispered conversation, and b. I had forgotten the most important tool in the parenting toolbox: EMPATHY. So I switched. Yeah, you don’t want that lady to sit here. She is too close to you. You don’t want to share the table with her. I said she could sit here and I didn’t even ask you if that was okay. You want to spread out and play play-doh on that side of the table too. You don’t know that lady. You don’t want to be near her. You had a different idea about how it was going to be here. Will you talk for this guy? – (picking up a toy)- He’s the Papa, and I will be the baby…. and they are walking together…. okay? I wasn’t brave enough today. I was willing to try almost anything to hide Echo’s true feelings, so that I could avoid an awkward interaction. Luckily empathy saved me and I wasn’t forced to. Entry filed under: empathy, parenting principles. Tags: being polite, empathy, manners. Society is a difficult place and concept, and balancing our feelings, our childrens’ and those of the people around us is never easy. Not to be mean, but I was almost glad to see your conundrum because it showed me I’m not the only one with those troubles. Oh…I’ve just found your blog and am really knew to NVC and your situation was beautiful. (okay..maybe not to you – but you handled it beautifully.) My son 3 1/2 is very strong willed and we try our best and at some point the frustration over takes me. Glad to see it working for others…knowing it will eventually work for me too. Thank you so much for this.